I'm about halfway through The Conan Chronicles: Volume 1: The People of the Black Circle and I’m absolutely loving it. 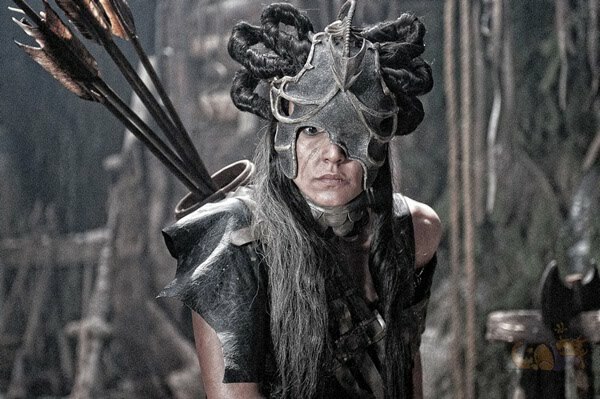 Along with seeing Jason Momoa's Conan The Barbarian I have been reacquainted with my favourite barbarian and engrossed in his high adventures across the lands of the Hyborian Age. The book chronicles Robert E. Howard's definitive Conan stories in the order they were written so I’m following Conan’s adventures as he grows in skill. Much like Conan himself, Howard’s prose is sparse yet his tales are incredibly imaginative and full of mythical creatures, dangerous lands, sneaky, fantastical and powerful adversaries. 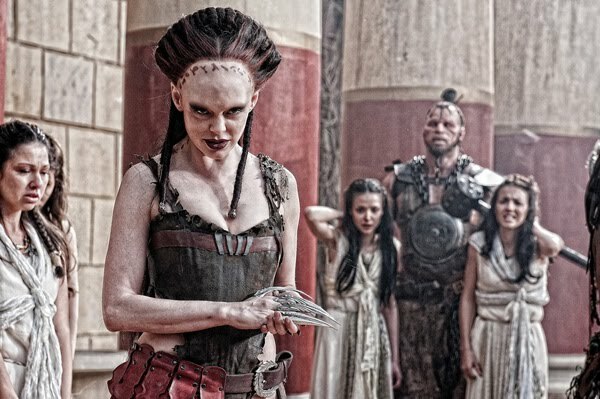 Much of which can be seen on the big screen in 3D in Marcus Nispel’s Conan The Barbarian. 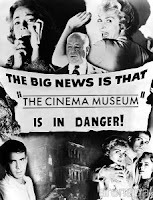 My red carpet report and review can be found here! 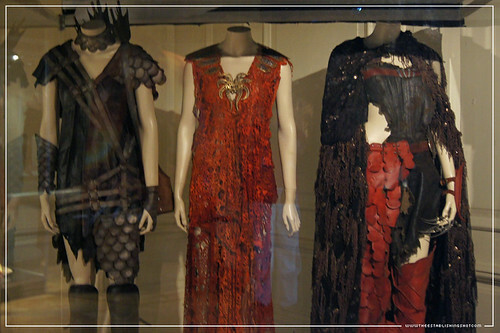 A while back I popped into the wonderful London Film Museum to see the Lionsgate Conan The Barbarian Exhibition and get an eye full of some of the original costumes and props featured in the film on display. 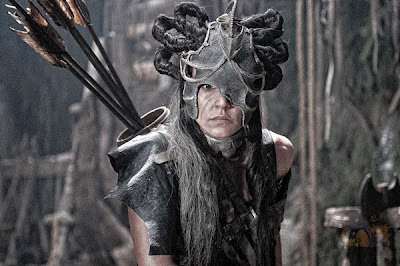 Conan The Barbarian features the fantastic Hyborian Age and the filmmakers put a lot of effort to make the film seem realistic, which can be seen in the costumes on display at The London Film Museum. 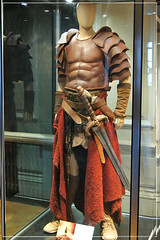 Jason Momoa's Conan The Barbarian Leather Armour from the climax of the film. 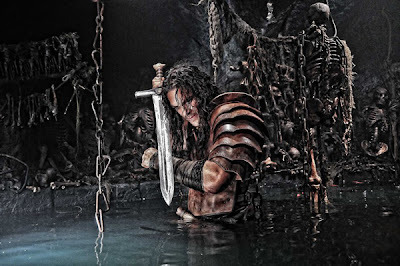 That includes both his dagger from the film as well as his father's sword - The Sword of Corin. 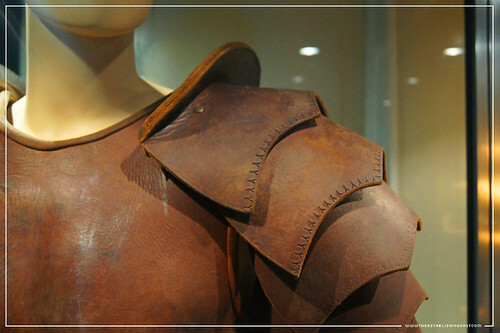 Conan The Barbarian Exhibition - London Film Museum : Jason Momoa's Conan The Barbarian Leather Battle Armour from Conan The Barbarian - Shoulder Pauldron, a photo by Craig Grobler on Flickr. Conan The Barbarian Exhibition - London Film Museum : Jason Momoa's Conan The Barbarian Leather Battle Armour, his father's The Sword of Corin & Dagger from Conan The Barbarian, a photo by Craig Grobler on Flickr. Conan The Barbarian Exhibition - London Film Museum : Jason Momoa's Conan The Barbarian Leather Battle Armour & his father's The Sword of Corin from Conan The Barbarian, a photo by Craig Grobler on Flickr. 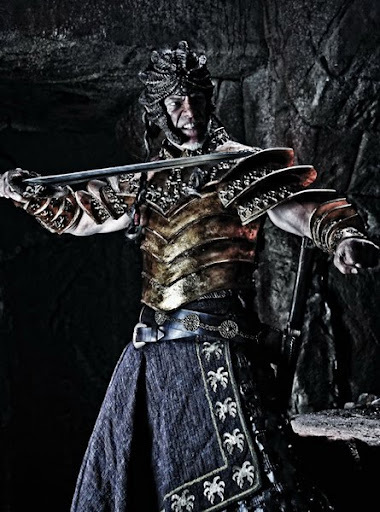 Stephen Lang's Khalar Zym Golden Armour from the sacrificial ritual in the climax of the film. This display includes Conan's sword, which I assume Zym has stolen as well as his own Double Bladed Parallel Scimitar, which is unfortunately sheathed. 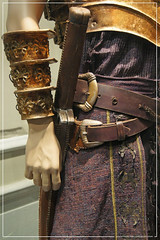 Conan The Barbarian Exhibition - London Film Museum : Detail Stephen Lang's Khalar Zym Gold Armour & Conan's Sword from Conan The Barbarian, a photo by Craig Grobler on Flickr. 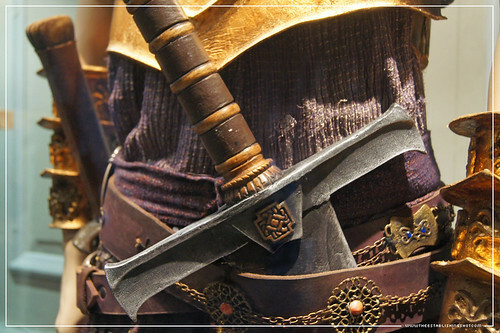 Conan The Barbarian Exhibition - London Film Museum : Stephen Lang's Khalar Zym Gold Armour & Double Bladed Parallel Scimitar from Conan The Barbarian, a photo by Craig Grobler on Flickr. 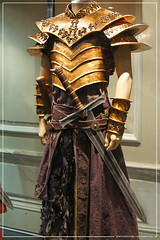 Conan The Barbarian Exhibition - London Film Museum : Stephen Lang's Khalar Zym Gold Armour from Conan The Barbarian, a photo by Craig Grobler on Flickr. In a separate display case you can view The Mask of Acheron or Blood Mask. Which is the very item that brings Conan and Khalar into conflict. Next to it is Diana Lubenova's Warrior Archer Cheren's Battle mask. Both masks are in their closed form. 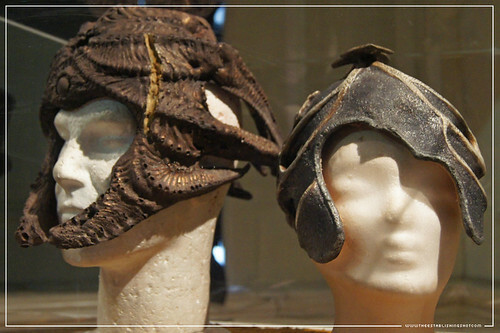 Conan The Barbarian Exhibition - London Film Museum : The Mask of Acheron or Blood Mask & Diana Lubenova's Warrior Archer Cheren's Battle mask from Conan The Barbarian, a photo by Craig Grobler on Flickr. The final display case houses the underutilised character Diana Lubenova's Warrior Archer Cheren's Battle Armour. 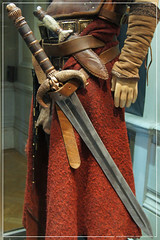 Conan The Barbarian Exhibition - London Film Museum, a photo by Craig Grobler on Flickr. Conan The Barbarian Exhibition - London Film Museum : Diana Lubenova's Warrior Archer Cheren Battle Armour, Arrows & quiver from Conan The Barbarian, a photo by Craig Grobler on Flickr. 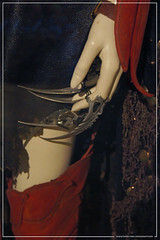 Conan The Barbarian Exhibition - London Film Museum : Detail Rose McGowen's Sorceress Marique steel claws from Conan The Barbarian, a photo by Craig Grobler on Flickr.Conan The Barbarian Exhibition - London Film Museum : Rachel Nichols' Tamara Sacrificial Costume (Khalar Zym's wife's wedding gown) from from Conan The Barbarian, a photo by Craig Grobler on Flickr. 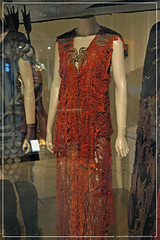 Rachel Nichols' Tamara sacrificial gown, that was originally Khalar's wife's wedding gown. 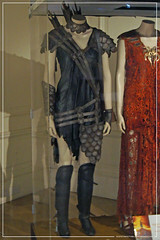 Rose McGowan's Marique Sorceress outfit including her lethal steel claws used to great effect in the film. To see the full set of photos of the Conan The Barbarian Exhibition at The London Film Museum head over here! Conan the Barbarian The colossal legend that is CONAN THE BARBARIAN is back this Summer. 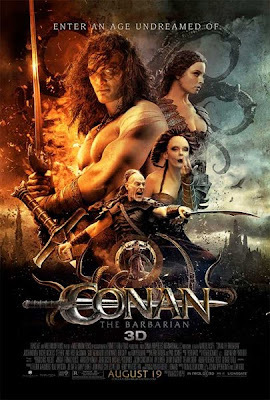 Having thrived and evolved for eight decades in the public imagination - in prose and graphics, on the big screen and small - Conan’s exploits in the Hyborian Age now come alive like never before. Shot in 3D, the reimagining of one man’s mythical battle for revenge is finally here in this Epic action-adventure film. Directed By Marcus Nispel Director: Marcus Nispel Stars: Jason Momoa as Conan, plus Rachel Nichols, Stephen Lang, Rose McGowan, Said Taghmaoui and Ron Perlman. Cheren (although I didn't remember her looking so... old) wasn't the only underutilized character in this film. Valeria and Xaltotun were also supposedly in there, but I've watched it several times, paying as close attention as I can, and I can't recall them even being named. 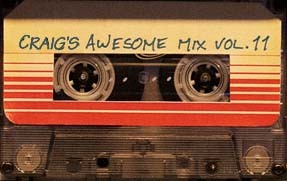 I enjoyed the movie and it's definitely superior to the 82 Arnie film (though Arnie's Conan will always have a special place in my heart), but it could have been so much better.